After carefully taking inventory of my closet (am I the only one who feels they have nothing to wear despite lots of shopping? ), I decided that I was lacking in the shoe department. 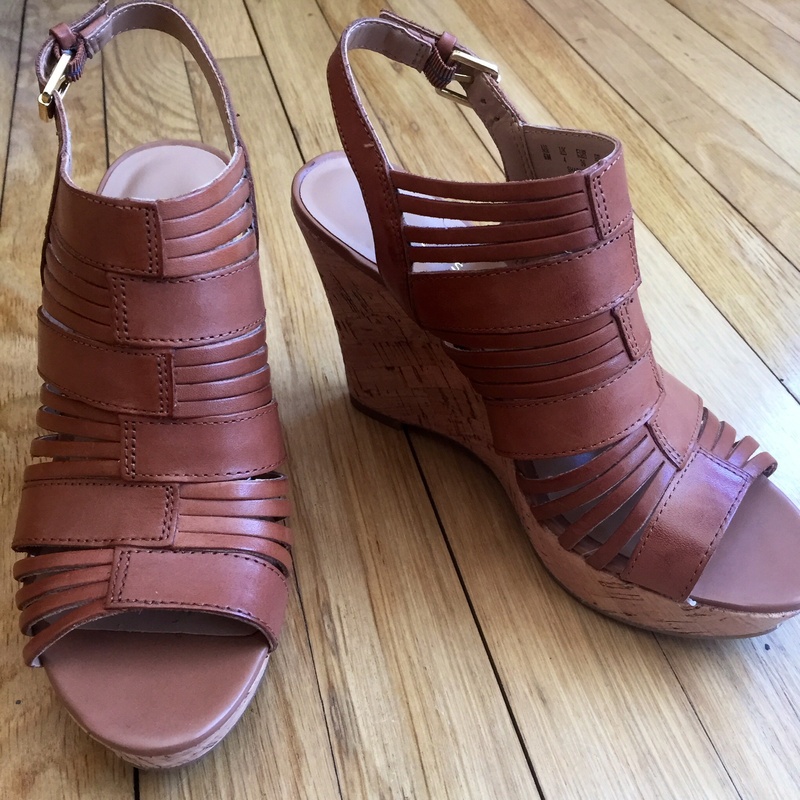 Don’t get me wrong — I have plenty of work appropriate heels, flats and riding boots in my closet, but once the summer rolls around I seem to live in either my C. Wonder sandals (which I love) or my Michael Kors open-toe heels (which I love…have served me well…and are very comfortable!). But after some consideration, I came to the conclusion that my closet was missing the classic wedge. It’s the best of both worlds. All of the convenience of a heel, but way more comfortable. I’m a bit picky when it comes to shoe shopping. I tend to find something I don’t like about every single pair I see. So when I ran over to DSW to check their selection, I was not immediately hopeful. I wasn’t sure what I was looking for, except that I wanted a wedge sandal. Naturally, I got distracted from my original mission (easy to do at DSW!) and wandered aimlessly down a few aisles, before I spotted them…a pair of Franco Sarto wedges! Not too high…not too flimsy…and in just the right shade of brown to elongate my legs when I have a tan. Since I own two pairs of Franco Sarto riding boots, I was confident that I would love these wedges too. In less than five minutes I had found my size, tried them on (so comfy!) and was happily on my way to checkout. Now if only I can bring myself to retire my Michael Kors heels! Thanks so much! I’m very happy with my purchase! Girl it is so true every woman needs a few good pair of wedges in her closet, and those are super cute! Right? Wedges are the best. And when they are cute and comfy, then they must be welcomed into my closet! Thanks Jillian! I loved them when I spotted them in the store. Can’t wait to explore CA in them! Such cute wedges!! I actually need a new pair myself. Think I’m going to head over to DSW this week! Thanks Kate! They are so comfy too. You should definitely check out DSW’s selection. great pick! very fun wedges! I’m a shoe addict so I have more than enough shoes, just not enough bottoms! Skirts and pants are on my radar now!! These wedges are beautiful! Do check my shoe blogs! Thank you. I love wedges. They are so comfy!